Khloe Kardashian is giving fans a glimpse into her cupcake party with family. The 34-year-old shared photos Thursday of True, her 6-month-old daughter with Tristan Thompson, attending a bash with North West and True's other cousins. 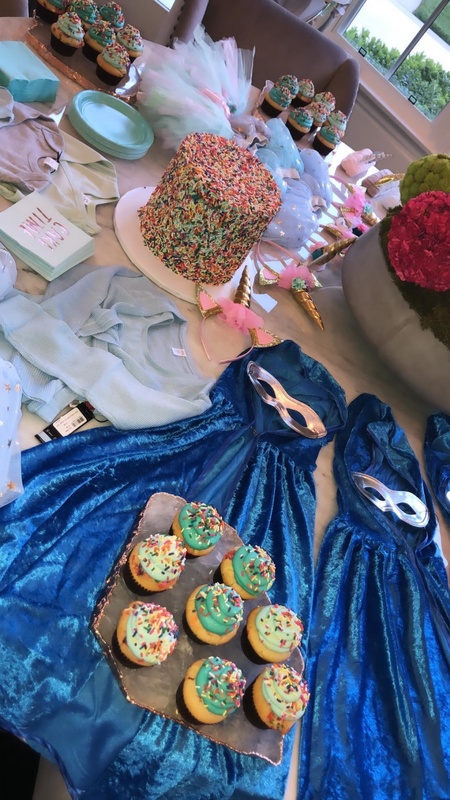 Kardashian and her sisters provided the kids with unicorn costumes and other outfits, in addition to an array of cakes and cupcakes. Kardashian shared photos and videos of the spread on Instagram Stories. "A little @breescakes for the cupcake party," she wrote. The "Keeping Up with the Kardashians" star also captured a photo of True with her grandmother, Mary Jo Campbell. Kardashian previously told fans she planned the party in honor of North returning home to the U.S. The 5-year-old accompanied her parents, Kim and Kanye West, on their trip to Uganda this month. "I'm so excited!! Planning another cupcake party 4 Norths return w all the cousins. Maybe this time @kourtneykardash won't 'forget' lol I mean..." Kardashian tweeted Oct. 13. "I bought all the girls tutus this morning! You know we have a color scheme to abide by," she added. "I need to buy the boys something too. Maybe capes for the boys!!!" Kardashian gave birth to True in April. She shared a photo of her daughter wearing an all-pink ensemble in August following a trip to Mexico with Thompson.